Fernando Llorente and Lucas Moura scored first-half braces as Tottenham cruised past Roma in San Diego. Fernando Llorente and Lucas Moura scored twice in the first half as Tottenham accounted for Roma 4-1 in their International Champions Cup opener. Spurs went behind to an early Patrik Schick goal at the Qualcomm Stadium in San Diego, but Llorente – who was deputising up front in the absence of Harry Kane – netted twice in nine minutes to make it 2-1 on Wednesday. 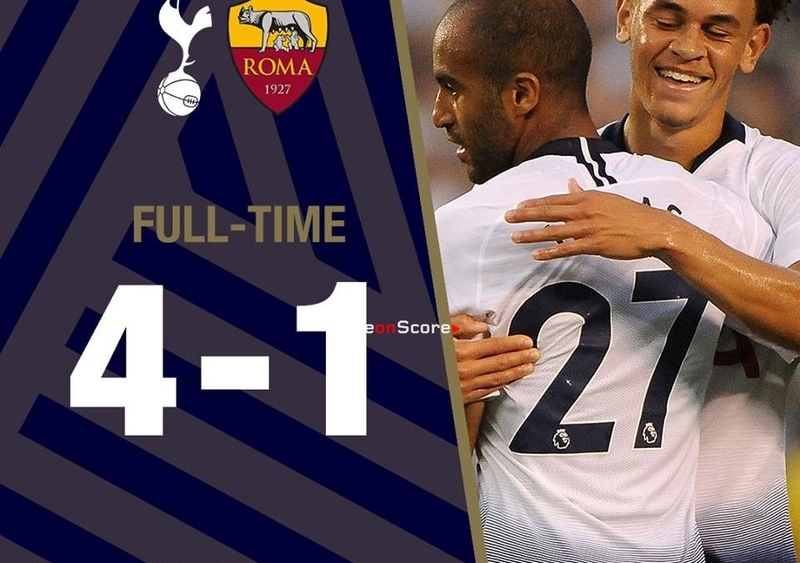 Moura then scored twice before half-time to put the result beyond doubt as Tottenham opened their ICC campaign with victory against the Serie A outfit. Roma, who reached the Champions League semi-finals last season, made the perfect start as Czech forward Schick found the far corner of the net inside three minutes for his fifth goal in three pre-season fixtures. But Spurs hit back six minutes later when Spanish veteran Llorente latched onto a deflected Luke Amos cross to head in the equaliser. The former Juventus, Bilbao and Swansea forward then gave Tottenham the lead when he followed up from Moura’s saved shot at the back post. Former Paris Saint-Germain winger Moura was becoming an influential figure Spurs, and having provided the assist for Llorente’s second goal, the Brazilian added a third when he headed home Serge Aurier’s pin-point cross. Moura scored Tottenham’s fourth goal on the stroke of half-time after he collected the ball on the edge of the area and drilled accurately into the bottom corner. 46 – We're back underway in San Diego and are unchanged at the start of the second half. A raft of changes were made by both teams as Son Heung-min and Davinson Sanchez featured in their first pre-season games for Spurs, while Daniele De Rossi, Edin Dzeko and Kevin Strootman were among the introductions for Roma. Substitute Tottenham goalkeeper Paulo Gazzaniga made a fine save with 15 minutes remaining when he turned Dzeko’s strike around the post. But there would be no further goals as Tottenham cruised to a comfortable win against their Italian opponents.